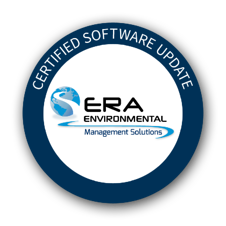 Two new features were recently added to the ERA-EMS system; a Regular Reports UI that will allow for queued report processing and a new Report Groups function will allow users to group and then run multiple reports. For more information and for webinar training, please visit the announcement page here. Users can now link Dynamic Reports to KPIs, allowing for the display of Dynamic Graphs. Users can now set up an hourly inspection reminder when creating an inspection task. Users will note that by completing an inspection process, the corresponding inspection event now gets completed. Upon generating an SDS, it can now be sent through an approval process. This limits who can approve SDSs and ultimately finalize them. Upon finalization, the document will become available in the SDS viewer. Additionally, any documents already available through SDS viewer will have an approval request sent when any attempt to update this document is dispatched, with the system now capable of generating a new SDS and providing a comparison report. Three reports can now be sent for approval. A new “Export Multiple SDS / MSDs” feature has been added. This allows multiple documents to be exported, together with an index file giving information on each document. This index file contains a link to open the document. The format of the index file is aligned to the SDS batch import – allowing for an easier exchange of documents. An improved functionality feature has been added related to UI / Imports. This allows for the use of alternate facility names, so that inventory records (purchases, receipts, returns, standing inventory) can be importing using a facility’s alternate name, rather than the original. This mirrors the alternate name function which is already available in Universal Import. A new warning was implemented to let users know that editing the first form of a project resets all following steps to “pending”, with the option to cancel. Within ‘Utility BPM Projects’, answers can be saved to several different tables in the system back end (instead of just a single table). The ‘Copy Value’ relationship has been developed for the ‘Assigned Facility’ to ‘Service Company’ datatype. The advanced menu option will be "greyed out" for users once a step has been completed. A report upgrade has been applied for compliance event summaries across multiple facilities. The automatic creation of follow-up tasks, depending on the selective corrective action, has been applied. ‘Employee Hire State’ has been added to the employee location section and also in the incident table. The “Import Product Usage” page has been re-named as “Universal Record Import”. A new function has been added whereby a record can be ignored based on the internal ID.